3. After you read each book for the challenge, come back here and tell us about it. Click on the correct category for your book (on the menu bar) and post the link to your review. We’ll use the same categories as last year: Cookbooks, Memoirs/Biographies, Fiction, and Nonfiction. I’ll also include a page where you link up your Challenge Wrap-Up post. The challenge runs from January 1 through December 31, 2013. It’s okay to cross over with other challenges. Sign in using Simply Linked below. Put your name and blog title on the first line. Put the link to your challenge post on the second line. Non-bloggers will use the comment section. 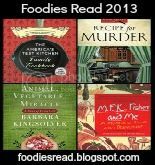 Hi and welcome to Foodies Read 2013! If you're like me, you love food about as much as you love reading. This challenge brings both of those loves together. I hope you decide to join the challenge. I can't wait to check out everyone's books.